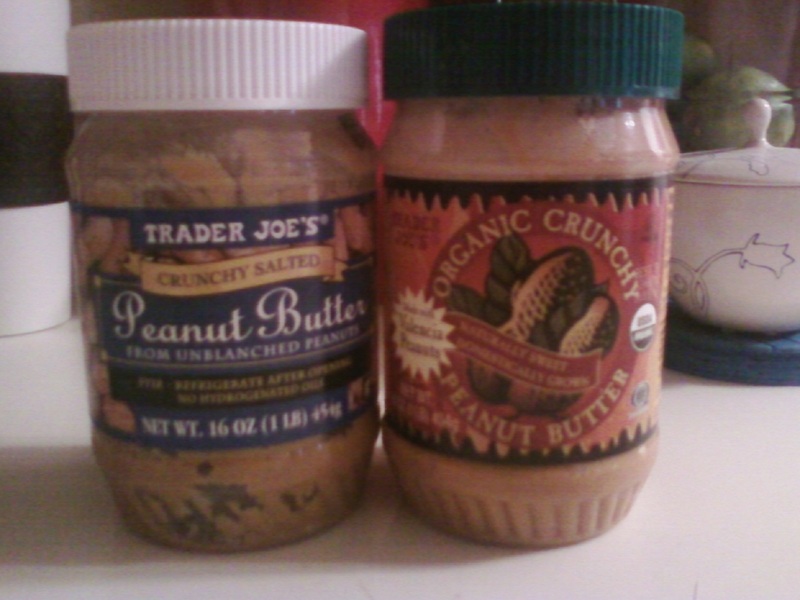 So here we have Trader Joe's Crunchy Salted Peanut Butter and Trader Joe's Organic Crunchy Peanut Butter. They're both good. They also come in unsalted varieties. I can't really tell a difference in the taste between the organic and regular. They both taste pretty fresh. I remember a farmer's market run by Mennonites in my hometown in central Pennsylvania that would pulverize peanuts (or any nuts you wanted) right before your eyes in a hand-cranked grinder to make a butter out of them. It was as fresh as could be. The taste of the Trader Joe's brand is exactly half-way between that ground-right-in-front-of-you-by-Amish-types flavor and that of any traditional grocery store brand. Considering that the price is in the same ballpark as Jif or Peter Pan, it's a pretty good value. I give them Four and a half Stars. Sonia gives them Four. Bottom line: 8.5 out of 10. I think TJ's peanut butter is the best peanut butter there is. I am whimpering looking at this picture because we have no Trader Joes in Montana. When people come visit I ask them to pick up some TJ cruchy for me. I love it. Love love love it. Container is not full, upon unsealing it. Too much liquidity of peanut butter, making it worthless. A non-full, too thin peanut-butter to spread is EXPENSIVE. Even more at the dollar value --- when it not be in a large enough size, enough to break further the price per ounce.